Fitness at Home is a free Windows 8 Fitness app that talks about some easy to do exercises, which you can do with objects available at home. For doing these exercises, you don’t need to take out special time, get gym equipments, or make a precise fitness schedule. You can do these exercises anywhere and slot them into your busy schedule. This free Windows 8 Fitness app guides you through some very useful exercises divided into three major categories: Upper Body Exercises, Core Exercises, and Lower Body Exercises. All these exercises can be done with easily available equipments at home such as water bottles, chairs, buckets etc. 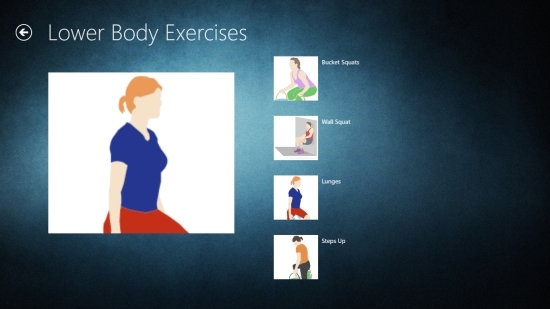 Fitness at Home is freely available in Health & Fitness category of Windows Store. You can view the app directly in Windows Store using the link given below at the end. 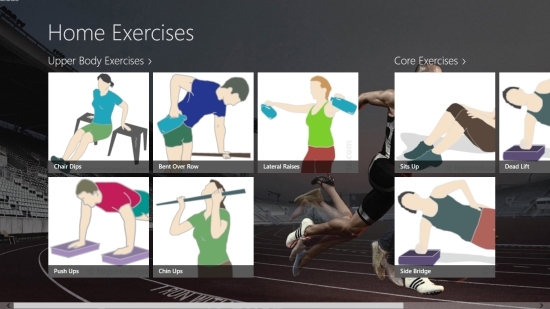 Let’s have a detailed look at this free Windows 8 Fitness app. To get access to the information given in the app, you will first need to install and launch this app on your Windows 8 PC. The main screen will display major categories with pictures of exercises covered under each category. Click on a category to open it. You will see a list of the exercises with name and pictures again. Click on any tile to open and read its description. The technique and other important information related to that exercise will be displayed along with a picture. You can flip through other exercises given in a category using the left and right headed arrows. Use back arrow button to go back to the main screen. Also check Exercise Anywhere and Yoga. Fitness at Home is a nice app for those who stay at home, want to do exercises but somehow, don’t have time for it due to their busy schedule. The best part is that you don’t need to go out to gym. You can convert simple objects available at home into gym equipments and club these exercises into your household jobs. Try this app and see it helps. Share your feedback via comments. Get Fitness at Home here!